The repairs cost $2,460, sources familiar with the payment EPA made said. Rep. Betty McCollum has a strong opinion about the Environmental Protection Agency’s decision to reimburse the owners of Administrator Scott Pruitt’s rented Capitol Hill condo for the cost of a busted door – and not just because she sits on the subcommittee that oversees the EPA’s budget. 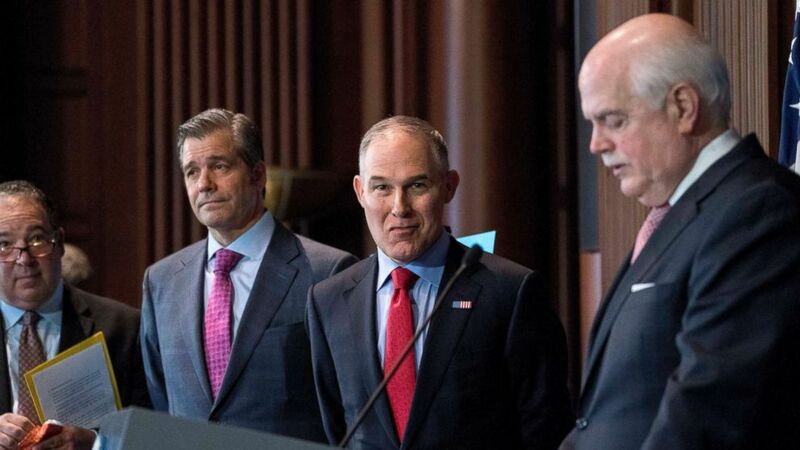 McCollum, a Minnesota Democrat, owns a condo downstairs and was on hand when Pruitt’s protective detail broke down the door because they could not reach him – an episode that occurred a year ago, but only came to light in an ABC News report last week. “I know that Congress appropriates money for the EPA to protect human health and the environment – not for repairs to the administrator's residence,” McCollum wrote in a letter to the EPA this week demanding answers. McCollum asked Pruitt if he has reimbursed the agency for the door broken down by his security detail at his condo last year. The repairs cost $2,460, according to sources familiar with the payment EPA made to a Capitol Hill condo association. (Andrew Harnik/AP) Environmental Protection Agency Administrator Scott Pruitt attends a news conference at the Environmental Protection Agency in Washington D.C., April 3, 2018, on his decision to scrap Obama administration fuel standards. Pruitt was renting a room at the time for $50-per-night from the wife of a veteran Washington lobbyist, J. Steven Hart, with energy company clients, ABC News reported last week. Pruitt has defended the arrangement in interviews this week, saying it was blessed by EPA ethics officials. Hart said in a statement said he did not lobby the EPA in 2017 or 2018. McCollum said she wants to know more about the reimbursement and is asking the EPA to specify which funds in the agency’s budget were used to fix the door. She was at home on March 29, 2017, when Pruitt’s security guards, concerned that the administrator was unresponsive, summoned Capitol Police to the scene. "I heard this pounding [on the door] and I thought somebody was working on a fence," McCollum recalled in a phone interview. "The pounding just kept going and going." When McCollum was unable to help them find a key to access Pruitt’s unit, local law enforcement called by Pruitt’s detail and Capitol Police broke down the door to the condo. Pruitt was inside, where he had been taking a nap, two sources tell ABC News. "If it was a private citizen and a 911 called happened, it would be the homeowner in the majority of cities that would be responsible," McCollum said about the EPA's payment to fix the door. EPA spokesman Jahan Wilcox told ABC News the agency "will respond to Congresswoman McCollum through the proper channel." McCollum is also in the process of writing a second letter to the EPA raising questions about reports that Pruitt circumvented the White House to provide raises to two staffers using a provision of the Safe Water Drinking Act. In an interview with Fox News Wednesday, Pruitt said he didn't know that the aides' salaries were raised, did not approve of the move, and had acted to reverse the decision. "It is not to be used as a slush fund to give favored employees raises," she said of the funds.